At the risk of stating the obvious, Sherlock Holmes is a bright spark, and in the BBC's rather splendid four season adaptation he has been portrayed as man who will know almost everything about you within 30 seconds of you meeting. 1. All violins played by Sherlock (four different ones in four seasons) are borrowed from Cardiff Violins and in season three it was a £1200 Con Fuoco. 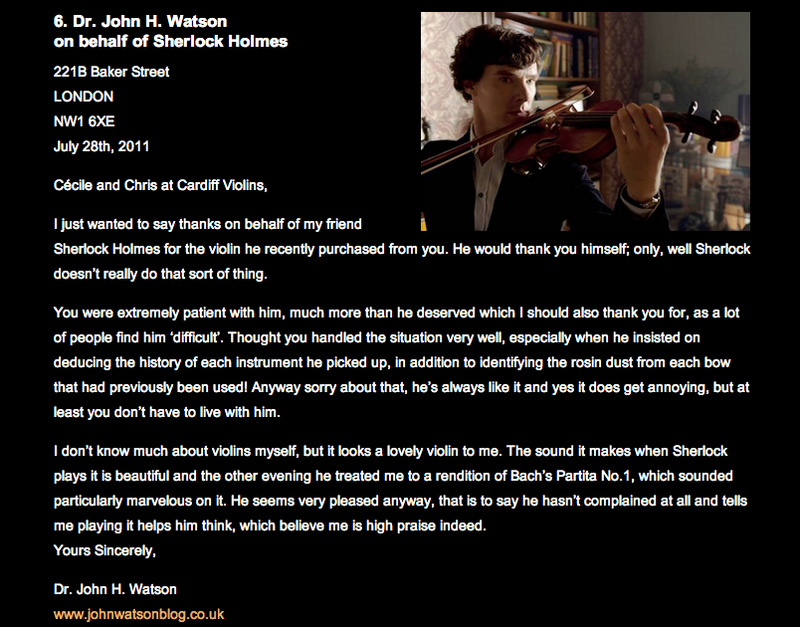 Rather wonderfully, after the BBC had returned the Con Fuoco, Cardiff Violins received this letter. 2. Baker Street, the original location of Arthur Conan Doyle's books, is said to now have too much Sherlock-related signage to be used as a filming location for the show. The BBC actually shot exteriors 1 mile east of there, at 187 North Gower Street. (NB: The blue plaque next door is for Giuseppe Mazzini, utterly unrelated). Interior shots were filmed in the BBC studio in Cardiff. There are 17 steps between the hall and front room on that very Cardiff set. Why? Because in Conan Doyle's A Scandal in Bohemia we find out that's exactly how many steps lead up to their quarters at 221b Baker Street. 3. The real life Speedy's Cafe was called "Mrs Hudson's Snax & Sandwiches" in the pilot episode, before that name was dropped. In series two episode A Scandal In Belgravia Speedy's was used for interior shots and was part repainted by the BBC. It still boasts Auntie's colour choice. Tourists stop by regularly (as you can see on their homepage) and you can even buy a "Sherlock" sandwich: Chicken, bacon, cheese, peppers, red onion, cucumber lettuce and your choice of hot chilli, sweet chilli or mayo. It's £4.10 to takeaway or £4.50 to eat in. There's a vegetarian option called the "Watson": Roast veg, spinach, three cheeses and spring onion. They sell t-shirts too. 4. Benedict Cumberbatch does a lot of his own stunts. Speaking on a 'making of' documentary on the series 2 DVD he says of the heart-stopping climax in which Sherlock jumps from a building roof (it was filmed on top of St. Bartholomew’s Hospital): “Doing the fall was really exciting. That’s me up on the roof. That’s not me jumping off the roof, but that’s me jumping off a smaller roof onto a lower roof, which is about four feet. And then that cuts to me on a wire dropping about 70 feet, onto a massive inflated bag. 5. It's well known that Sherlock's gloriously flowing coat is a discontinued £1350 Belstaff 'Milford' that the makers brought back into production for a short time, but have discontinued once more. Less well known is that Watson's shooting jacket (for our money the more wearable option) is a £725 Haversack coat from Liberty. Cruelly, it too is no longer available. 6. China's ban on the show hasn't stopped it becoming a huge hit on the internet, in the country. Despite not appearing on the Chinese Central ­Television network or other major channels, 69 million viewers have still seen it on video websites. Initially makers didn't expect it to be quite the hit it has been in the UK, either. Steven Moffat thought it would bring in somewhere in the region of 4 million viewers. It's average is more than double that. 8. Benedict Cumberbatch's parents play Sherlock Holmes’s parents. Wanda Ventham and Timothy Carlton (real name Timothy Carlton Cumberbatch) appeared in the first episode of series three, having tea at Sherlock's flat. 9. Watson's wife Mary Morstan is played by Martin Freeman's former real-life spouse Amanda Abbington. 10. The series pilot, titled A Study in Pink, was originally shot by director Coky Giedroyc as a 60-minute episode. This pilot went unaired and was reshot as a 90-minute episode by Paul McGuigan. The 60-minute unaired pilot is included in the Sherlock: Season 1 DVD and Blu-ray. Click play to watch a snippet of the original pilot next to the reshot and aired version. 11. The Sherlock finale generated a colossal 377,182 tweets, the highest volume of tweets for a single episode of a drama series in the UK. The Doctor Who 50th Anniversary adventure received more tweets but is counted as a special. 12. Let's talk accents. Andrew Scott auditioned for Moriarty with a British accent before the show's makers decided it would work better with his natural Irish accent, while Danish actor Lars Mikkelsen had to 'scandify' his accent for the role of Charles Augustus Magnussen. He had picked up a cockney accent while making a film in London, just before shooting for the His Last Vow episode commenced. 13. The 2011 riots in London forced the BBC to interrupt filming. Co-creator and the actor behind Mycroft Holmes, Mark Gatiss (pictured), tweeted in August of that year: "This is a new one on me. Scene incomplete owing to approaching looters. Unbelievable times." In a later interview with The Guardian, Gatiss said: "The riots were genuinely frightening. You can feel a bit silly doing 'showbiz' when stuff like that is going on." 14. Mycroft's umbrella is from a shop that's instantly recognisable to most Londoners. James Smith & Sons boasts a perfect example of Victorian shop front design. It has remained virtually unaltered in 140 years. It's based on New Oxford Street and although it is no longer allowed to sell them, its shop front still advertises the sale of "dagger canes" and "swordsticks". 15. In The Blind Banker in series 1 Watson tosses Sherlock a pen and Sherlock plucks it out of the air without even looking. Slick. Benedict Cumberbatch managed this on the first take but a problem with the camera meant they had to try three of four times to get it right again. How did he do it? He's totally looking in a mirror. 16. In the season four finale (The Final Problem), there’s a montage of cases in 221B Baker Street, wit one of them featuring an unconscious viking being seen to by Dr John Watson. That viking, who we only get a glimpse of for a few seconds, is in fact Modfather and lead singer of The Jam, Paul Weller, a close friend of Martin Freeman. We hope he didn’t get paid for this.